Final council meeting in GEF-6 investment cycle approves projects focused on Least Developed Countries and Small Island Developing States. Local communities in Africa will be helped to preserve their tropical rainforests, the world's second smallest nation will be assisted in switching from fossil fuels to renewable energy and 13 governments will be supported in preparing reports on the progress they are making to combat climate change, through projects approved today by the 54th Global Environment Facility (GEF) Council meeting in Da Nang, Vietnam. They are included in the GEF's latest work program, the final one under its sixth replenishment (GEF-6), which will cost US$64 million, but is expected to mobilise an additional US$300 million in co-financing ($5.2 for every dollar the GEF provides). The Food and Agriculture Organisation (FAO), UN Development Programme (UNDP), UN Environment (UNEP), WWF-US, the Asian Development Bank (ADB), and the International Union for the Conservation of Nature (IUCN) will implement projects approved in this work program. Some 13,000 hectares of tropical moist forest will be put under sustainable communal management in Equatorial Guinea. The country's forests are being progressively lost and degraded, notably communal ones whose communities do not feel involved in managing them. The FAO/GEF project will engage them in eight pilot areas, promoting sustainable local livelihoods, and, also convert 750 hectares of slash and burn agriculture into diverse agro-forestry. Preliminary estimates suggest it could reduce greenhouse gas emissions by 5 M tCO2e (the equivalent of five million tonnes of C02) over 20 years. Across the world, in Nauru – whose 10,000 people form the second smallest population of any country in the world – a UNDP/GEF project will help transform its fossil fuel based system for generating electricity and fuelling transport into one based on renewable sources and energy efficiency, mitigating emissions of 1 M tCO2e. And, a UNEP/GEF project will help 13 countries prepare and submit National Communications and Biennial Update Reports under the UN Framework Convention on Climate Change. property and infrastructure. It will enhance resilience to climate change and increase the sustainability of ecosystems through improving transboundary co-operation on integrated, ecosystem-based management of the river basin. 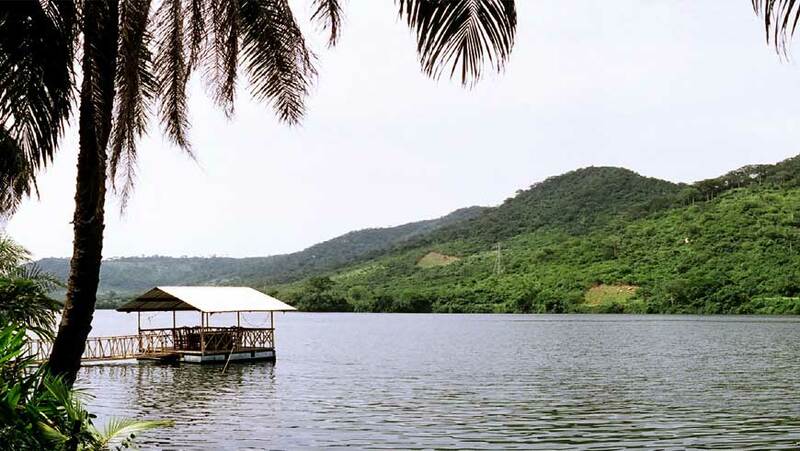 The 400,000 square kilometre Volta river basin in West Africa is shared by six countries – Benin, Burkina Faso, Côte D'Ivoire, Ghana, Mali and Togo – and its natural resources are vital for its peoples and economic development. A UNDP-IUCN/GEF project will lay the foundation for coordinated planning and informed decision making across boundaries and sectors on investments in the basin. It will support a region wide early warning system for droughts that reaches out to communities, as well as investment to protect and restore ecosystems to improve the livelihoods of local communities through, for example, enhancing the sustainability of freshwater fisheries, increasing the productivity of water use for crops and livestock, and helping to eradicate invasive species. Further south in Africa, in Lesotho, a UNDP/GEF project is to bring an innovative river-basin approach to addressing the degradation of land and ecosystems by integrating 34,500 hectares under sustainable land and water management. This will heighten the productivity of rangelands, increase cover by trees and vegetation, improve the fertility of the soil and its ability to retain water, and make both ecosystems and landscape more resilient to droughts and floods. Nearly 15,000 people living in the Sebapala watershed will benefit. Meanwhile the eight nations bordering the Bay of Bengal have been brought together to develop and agreed program for ocean governance that will conserve a region rich in marine resources on which some 450 million people depend. Now, a new FAO & ADB/GEF program will address the three major pressures facing shared ocean ecosystems – unsustainable fisheries, pollution, and the destruction of habitat – while improving livelihoods and increasing resilience. SIDS often rely for freshwater on shallow coastal aquifers that are recharged by rainfall, but are vulnerable to the impacts of land use and climate change. A UNDP/GEF project will improve their use, management and protection in Palau, Tuvalu and the Marshall Islands, so as to increase water security. Finally, another UNDP/GEF project will seek to safeguard the globally important biodiversity of São Tomé and Principe, all of which is a designated Key Biodiversity Area, with the island of Principe and its surroundings classified as a UNESCO Biosphere Reserve. The project will improve the management of nearly 41,200 hectares of land and sea, and place more than 15,700 hectares under sustainable land management. More details of the work program can be found here. The 54th Council meeting also approved a number of other decisions, including the negotiations of the seventh replenishment of the GEF Trust Fund (GEF-7), implementation of the GEF gender strategy, relations with the conventions and other international institutions, and reports from the GEF Scientific and Technical Advisory Panel, and the GEF Independent Evaluation Office. It will be followed by meetings of the 24th Least Developed Countries Fund/Special Climate Change Fund Council Meeting and a Civil Society Forum on June 26. And, from June 27-28, the Sixth GEF Assembly.